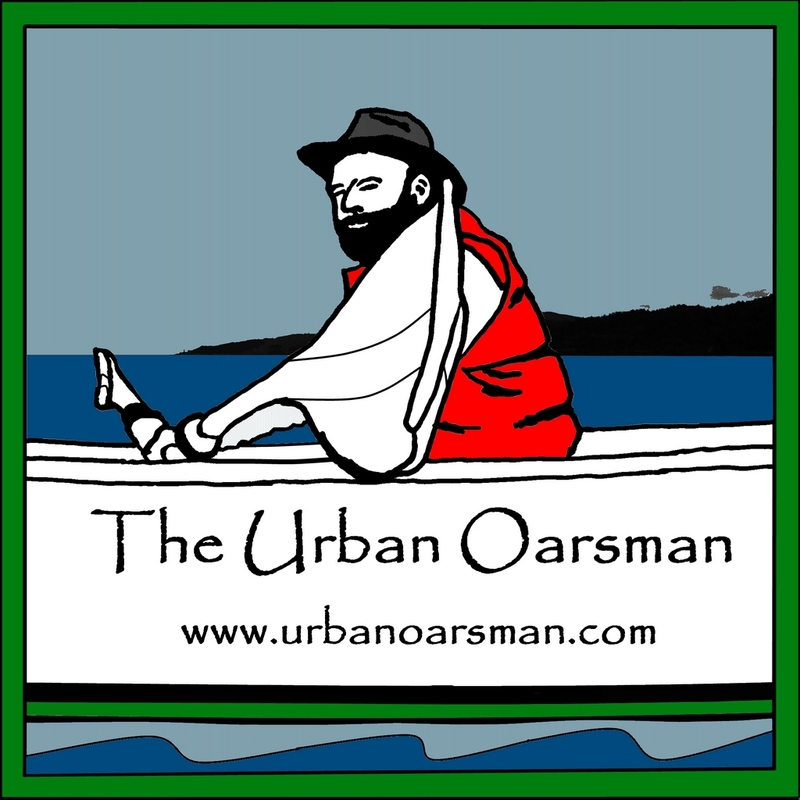 The Urban Oarsman Rows the Alouette River. 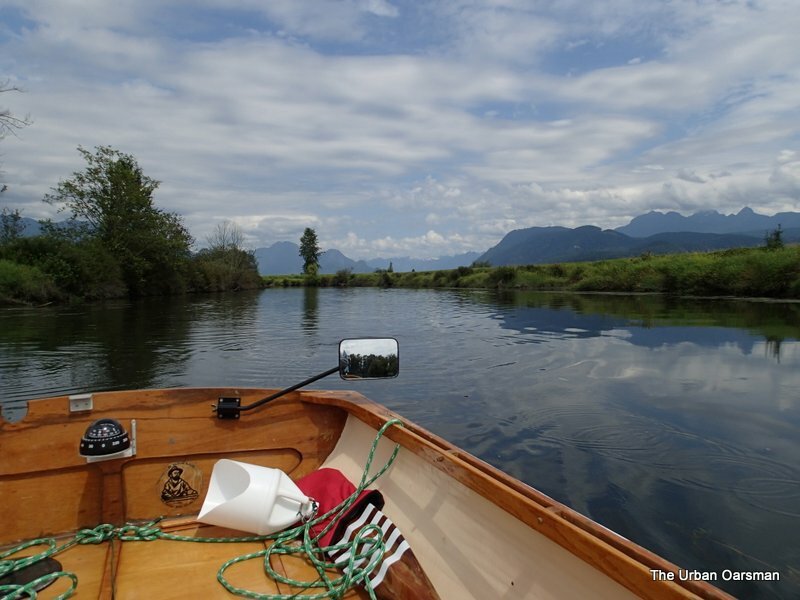 I have rowed Widgeon Creek, circumnavigated Siwash Island and voyaged from Grant Narrows to Maquabeak Park boat launch. It is time to Explore the Alouette. 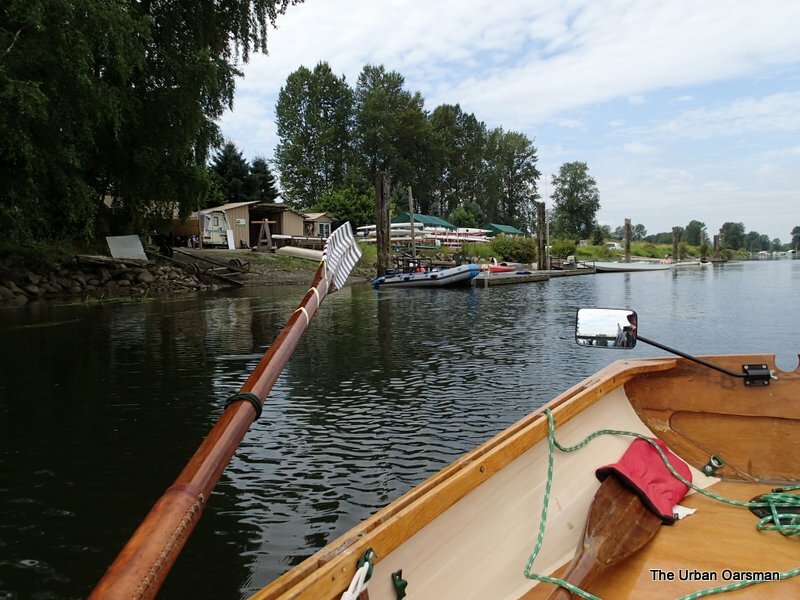 GPS track of the Alouette River Row. 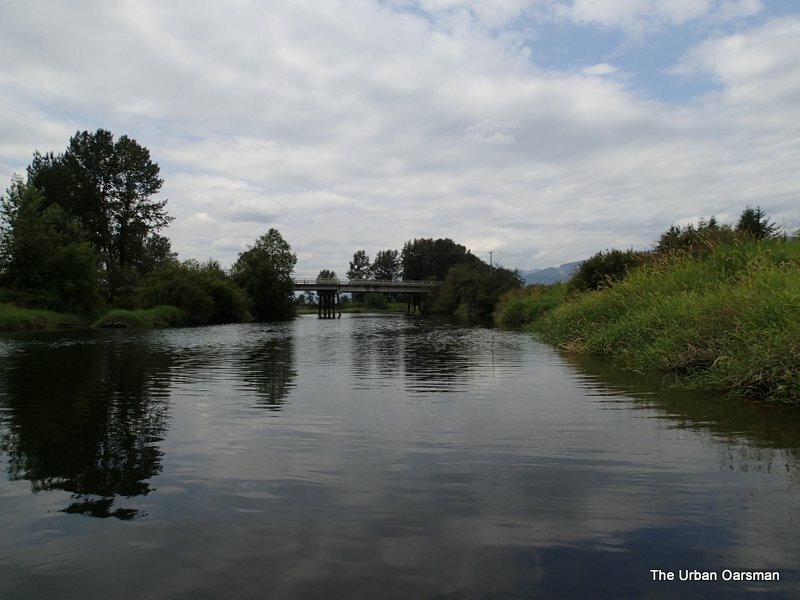 The Alouette River has several branches, The Alouette River, the North Alouette River, Blaney Creek and McKenzie Creek. On this row, I am going up the Alouette as far as I can get. I have a late start and a five hour window for this row. 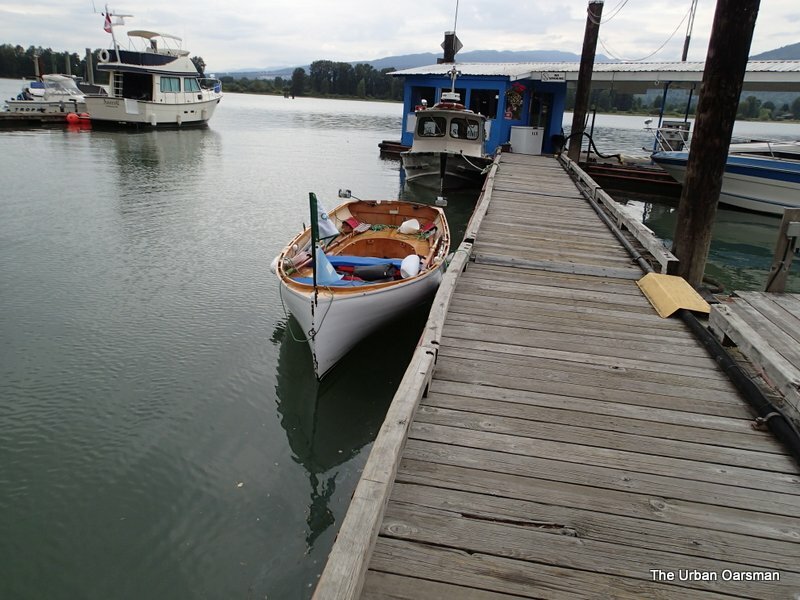 I launch Gwragedd Annwn at the Pitt Meadows Marina. $17.00 for the launch and parking. 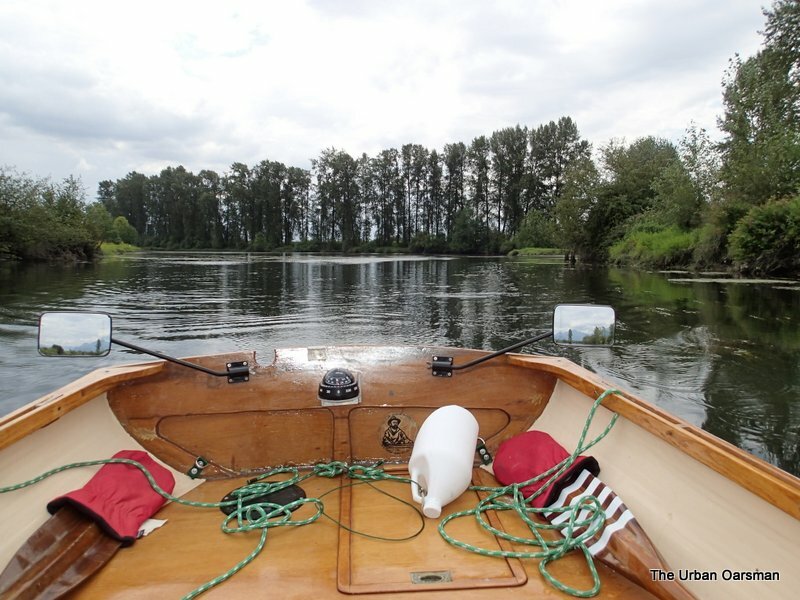 I begin to row up the Alouette. 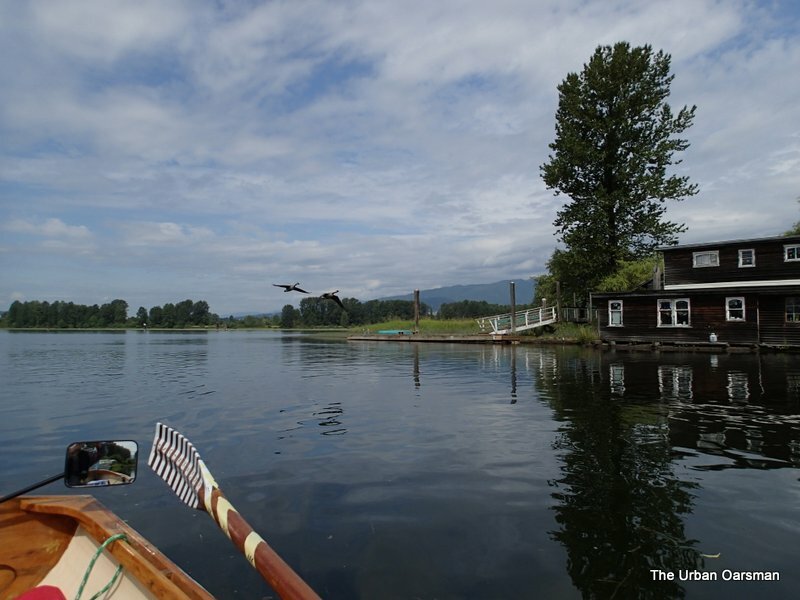 Rowing up the Alouette, across the Pitt River to the West Coquitlam, being passed by Geese. I start up the Alouette. On the north side of the river is a floathome with stained glass windows. Red boat sunk at dock. 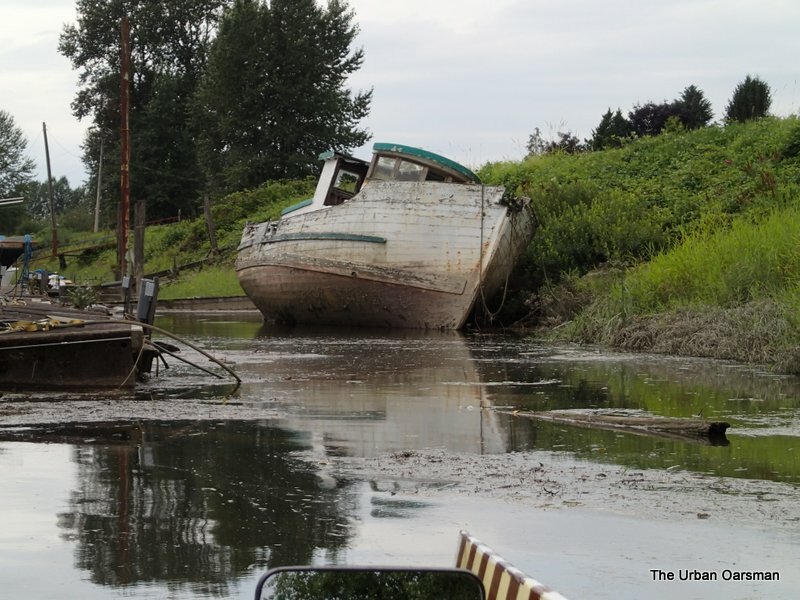 In researching this trip, I had seen pictures of this sunken/awash hull. She does not seem to have a name or registration number. 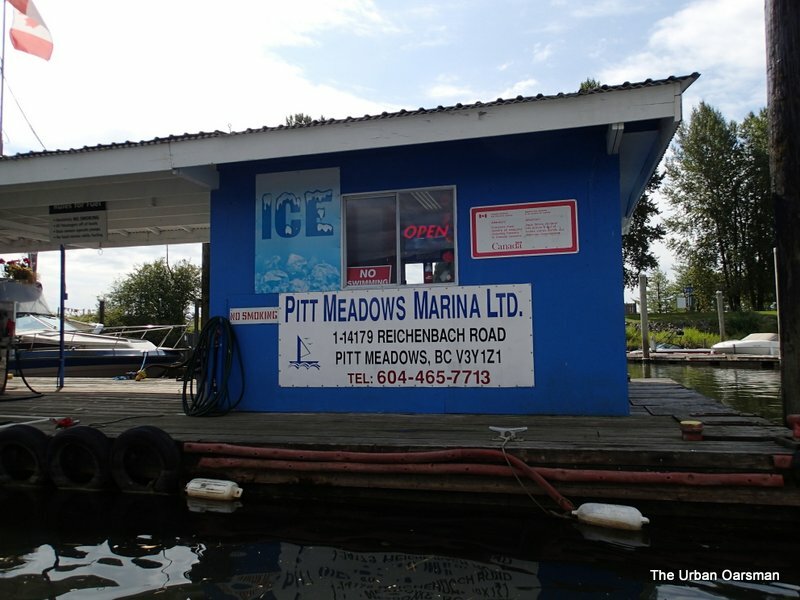 Past the Pitt Meadows Marina, most of the boats/boat houses are on the North bank where there is a power line. Up river towards the Harris Road Bridge. I continue up river. I have to watch out for snags in the water. 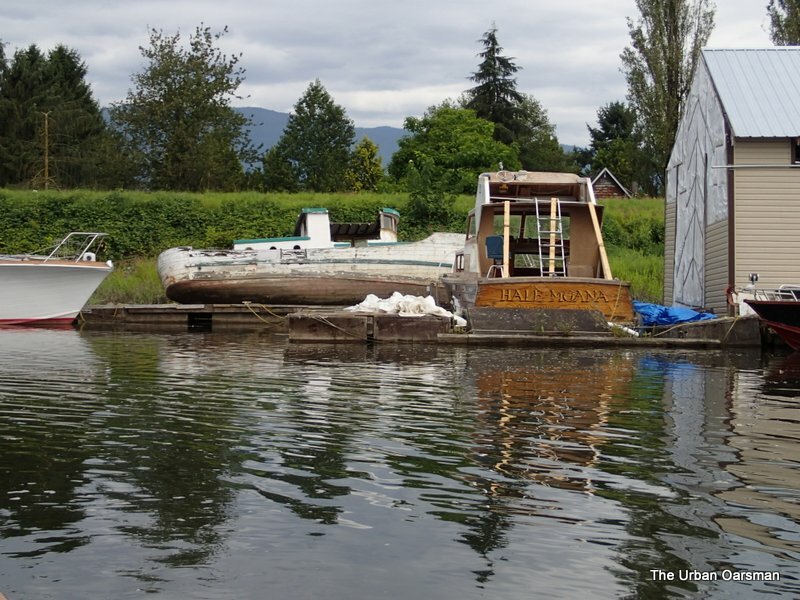 It looks as if this boat is being stripped. She, too, has no name. 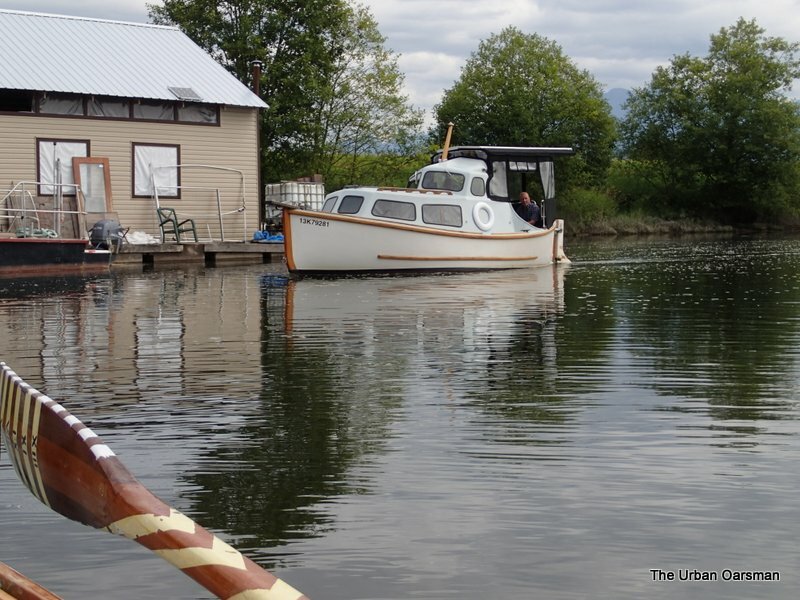 This is a cute boat. She is an electric Davidson “Chugger”. She gets over five hours of silent running time at 5 knots. On the South side of the channel there is a sunken boat. 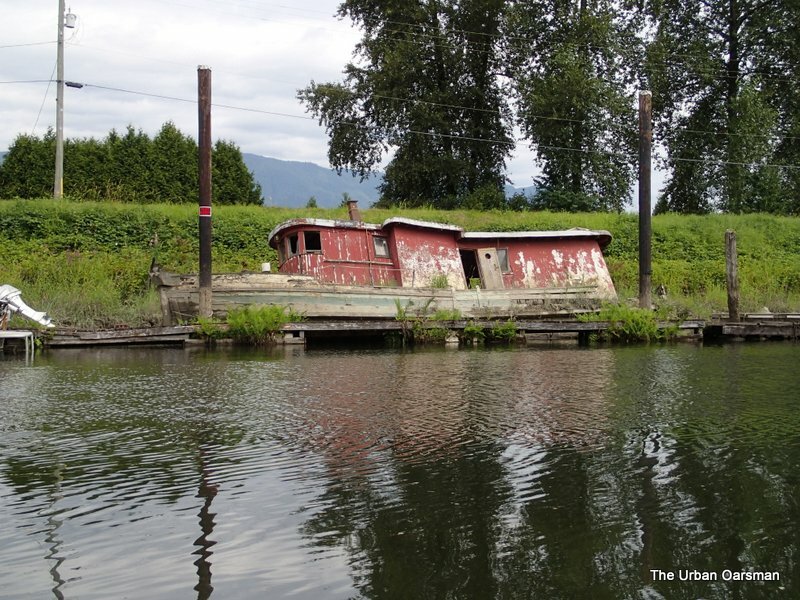 The drop in river level is evident on her cabin top. 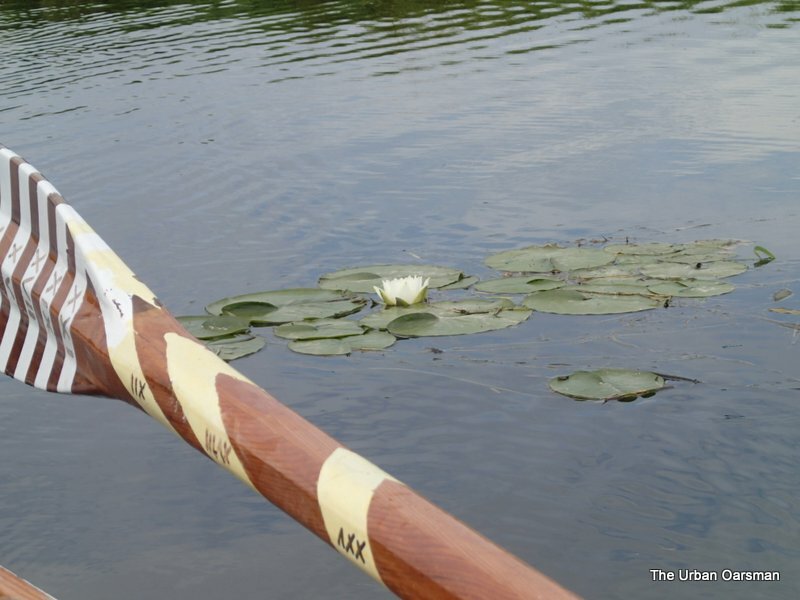 There is quite a collection of paddling craft on site. Harris Road Bridge, looking North. 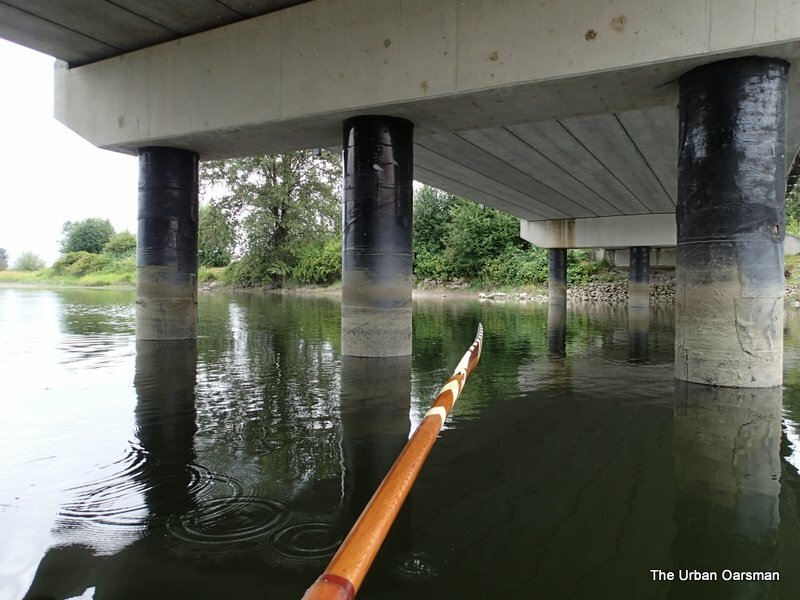 I row under the bridge. The Audubon Society Field Guide to north American Wildflowers (Western Region) comments: The seeds of this species were ground by Indians for flour and roasted as Popcorn. 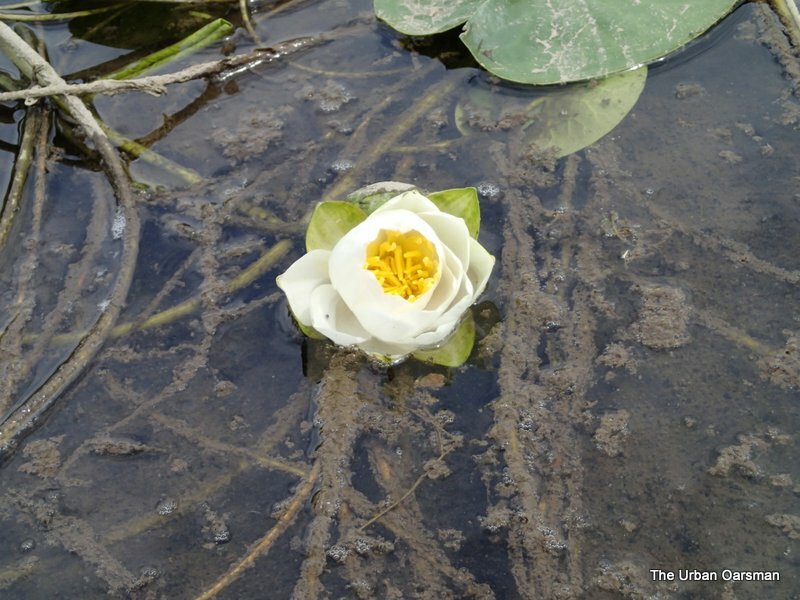 When the mud in which the stems grow loses oxygen, a small amount of alcohol instead of carbon dioxide is produced by this and some other aquatic plants, including rice. A Damselfly hitches a ride up river. Water lilies on the shore. 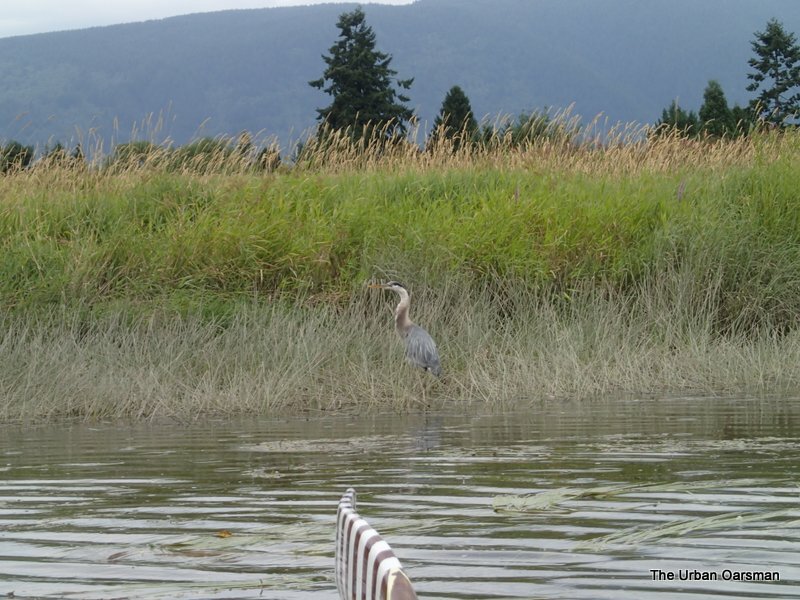 I saw numerous Blue Herons on the trip. Good thing that I am rowing. 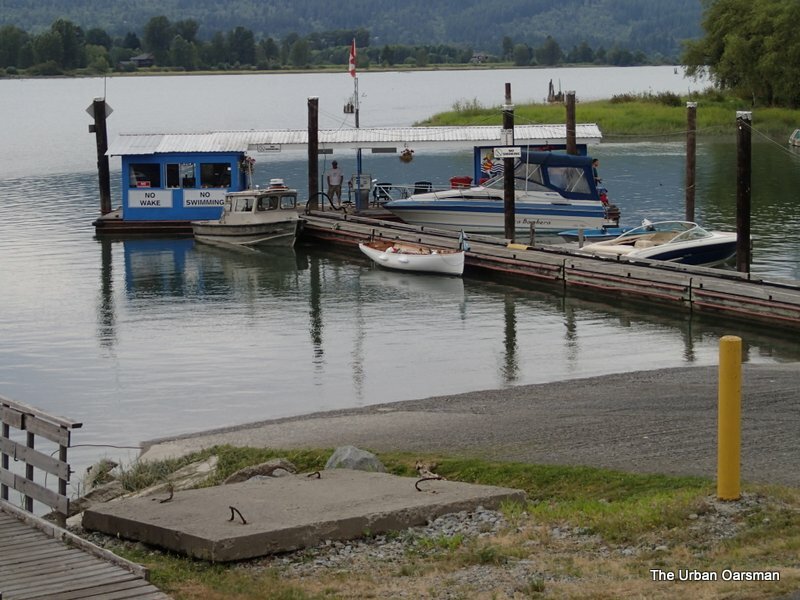 Where the North Alouette (left) and the Alouette (right) meet. 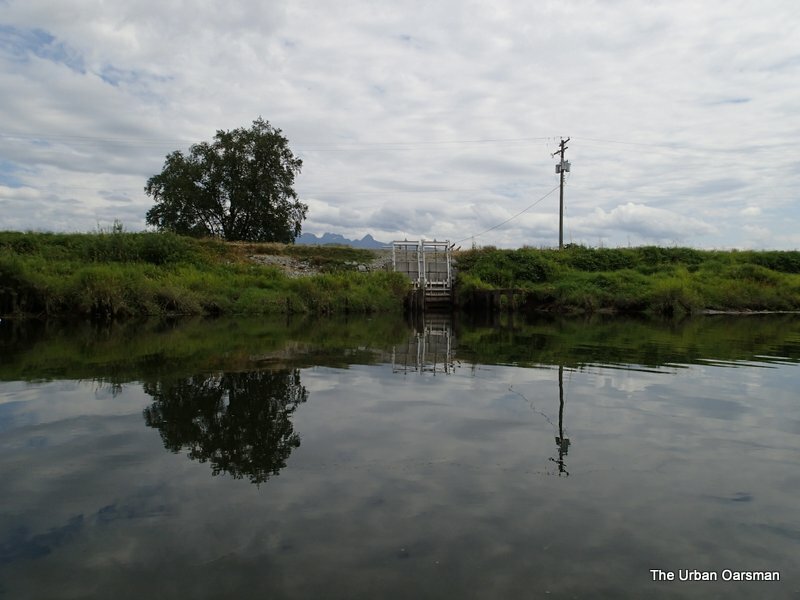 Pump station and River Gauge. 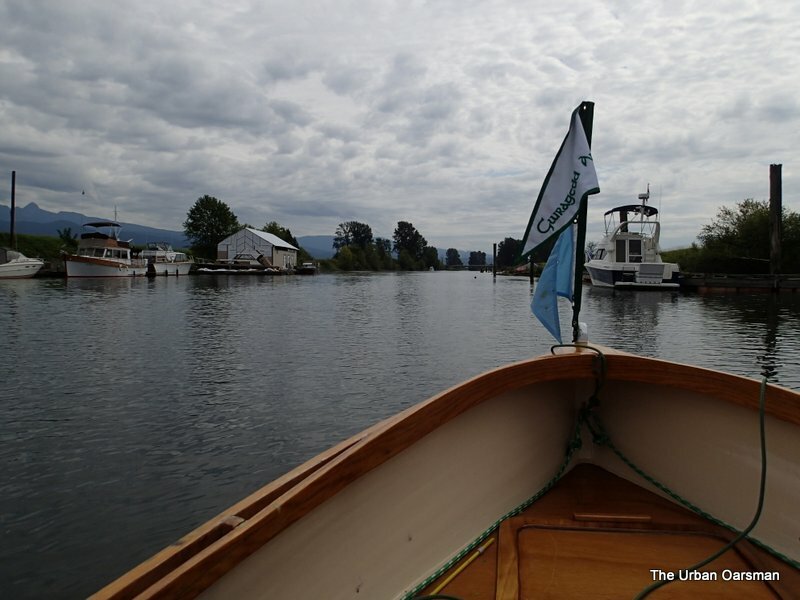 I row a few strokes up the North Alouette to look at the Pump Station and The River level gauge. Looking North West, down the Alouette, where I have come from. The white speck is a kayaker heading up river. 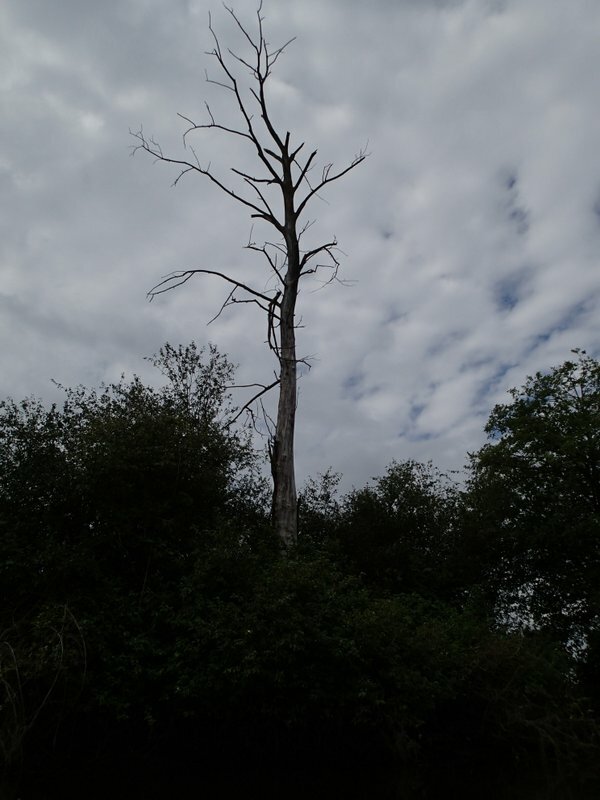 Dead Tree on un-named Island. 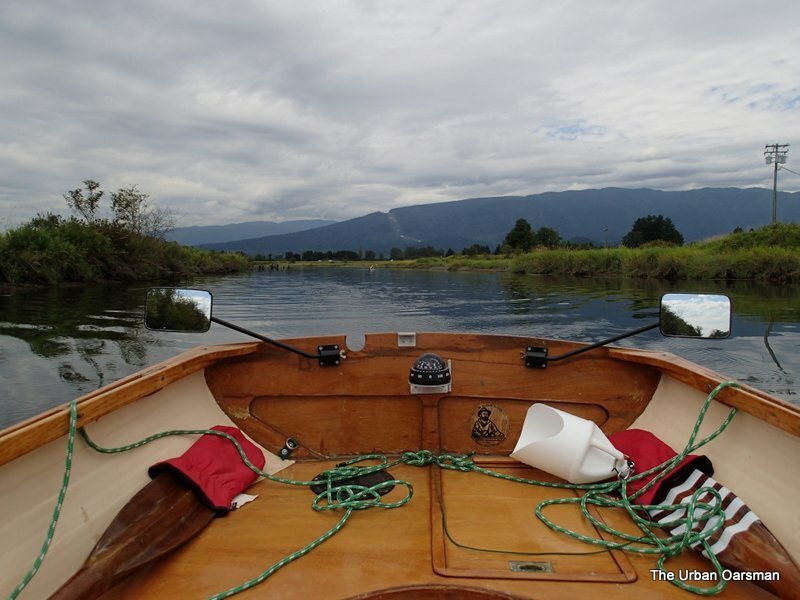 Just past the junction of the Alouette and the North Alouette River, there is an Island in the middle of the Alouette. I pick the North (larger) channel. 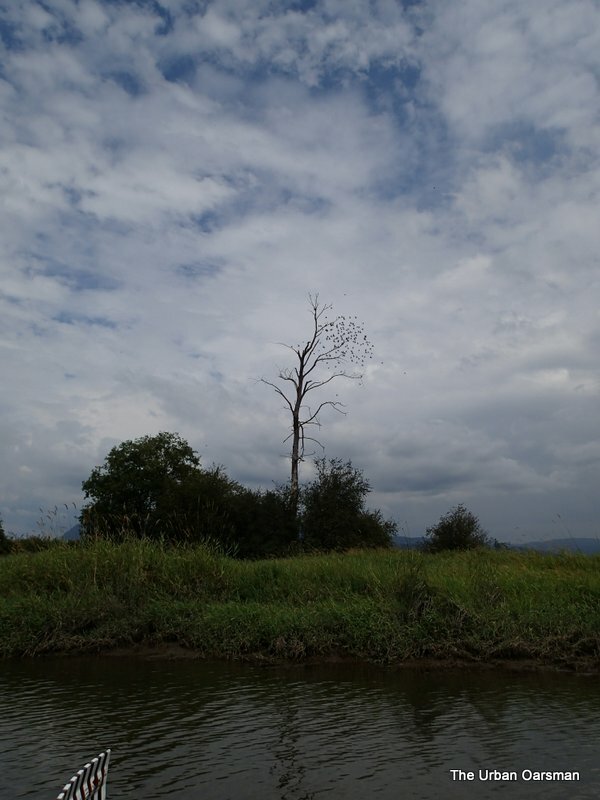 The Island is anchored by a large dead tree. Dead Tree Island? 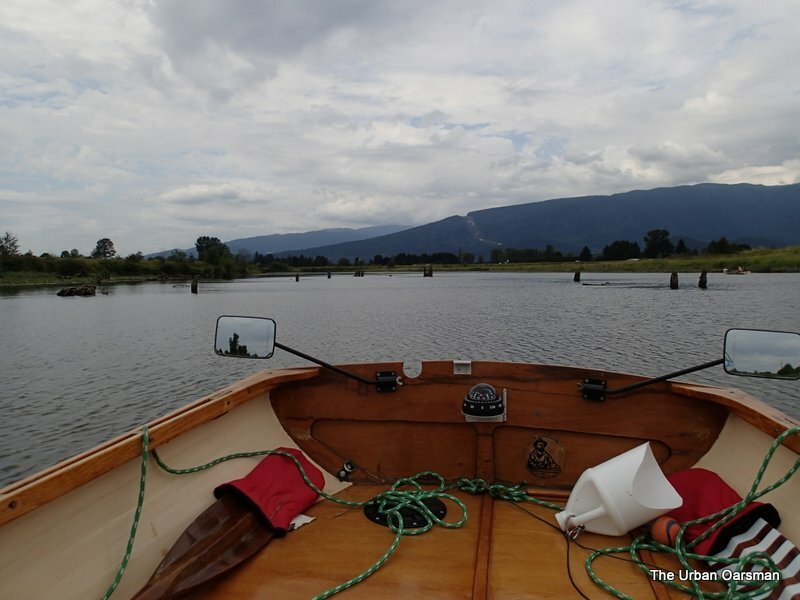 Looking back at what I have named Dead Tree Island that I have rowed past. 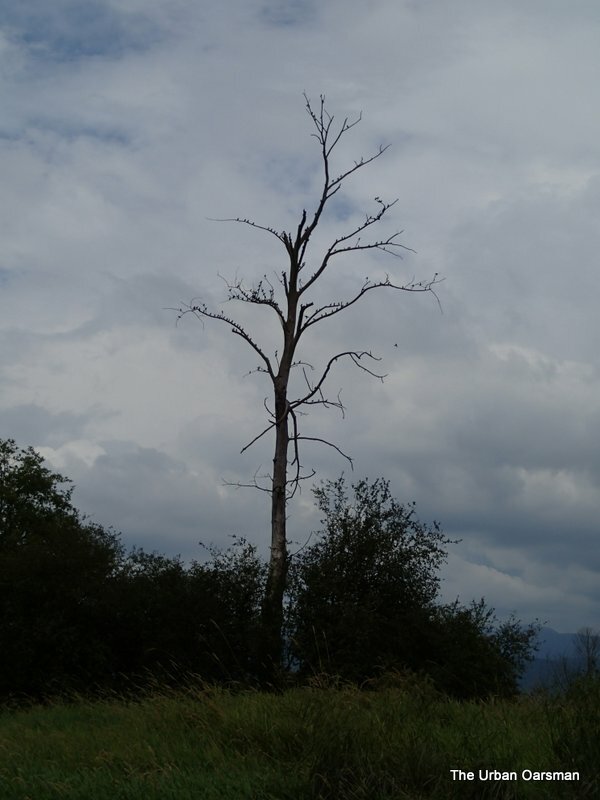 It is to the right, with the dead tree on it. 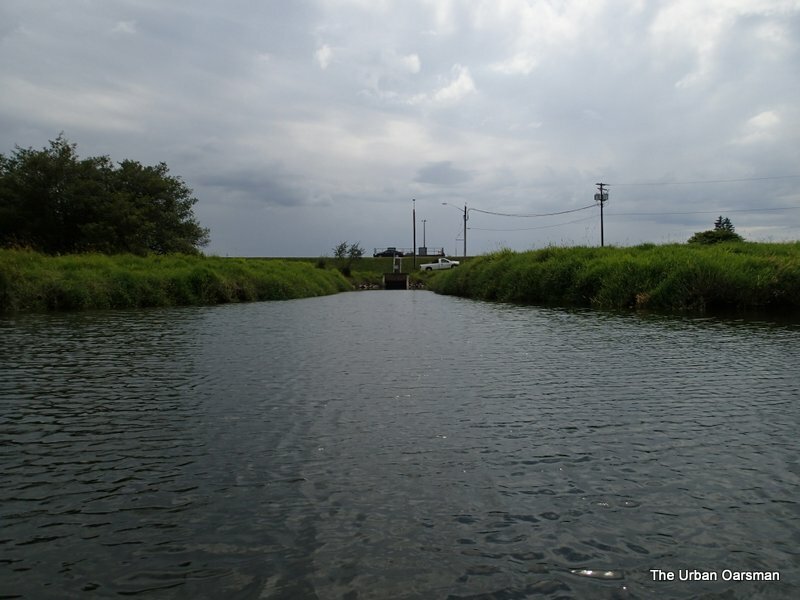 I continue on up river. 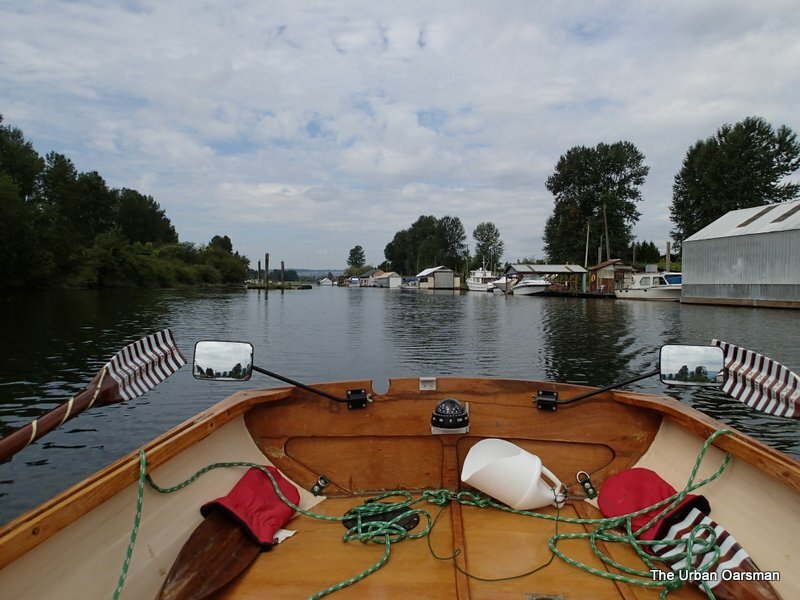 I do not see much “civilization” as I row. I am half way through my rowing window. Almost time to turn back. 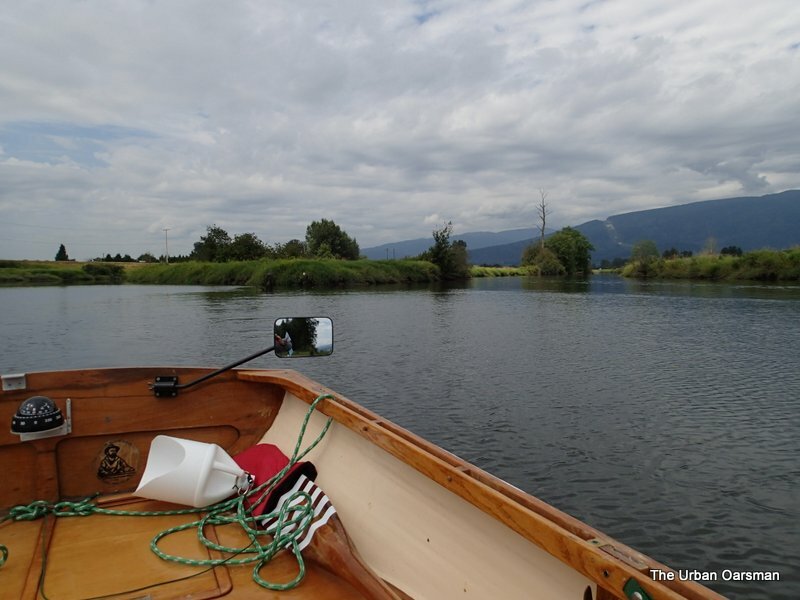 I think that I am good to row on a little further. I want to row off of the chart. The chart ends at the Neaves Road Bridge. Sadly, none of my pictures of the hand-held GPS chart worked out. 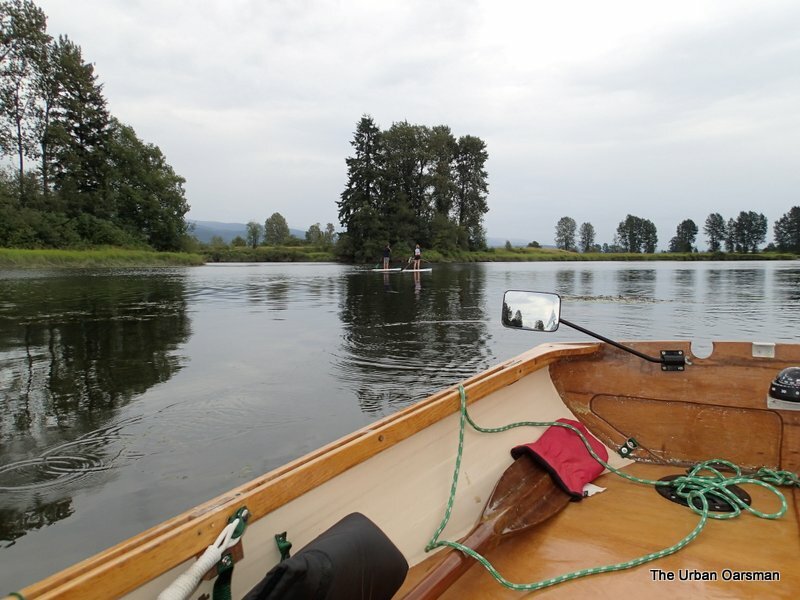 The chart I have rowed off is #3062, Pitt River and/et Pitt Lake. The Neves Road Bridge downriver to the west. 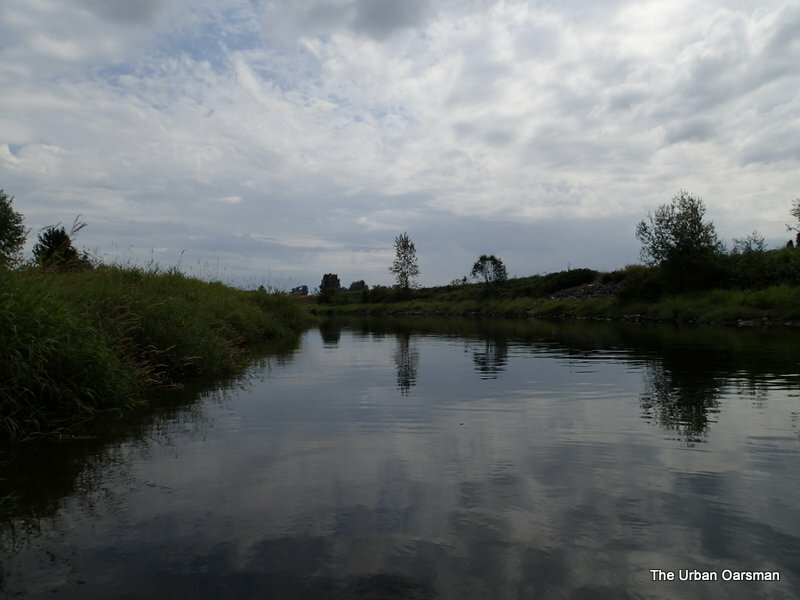 Looking upriver at uncharted waters. 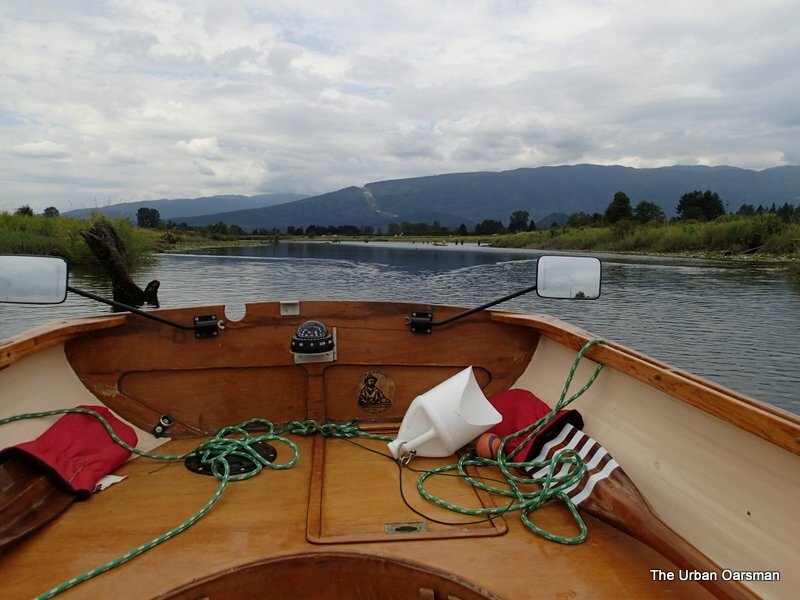 My rowing window is closing…Time to turn back. The supports for the bridges show previous water levels in the river. The level has dropped and is still dropping. 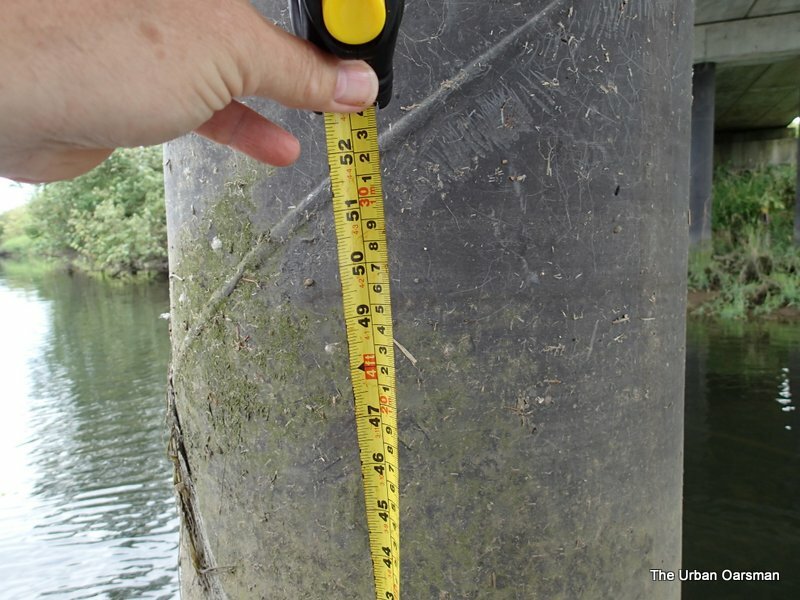 The pilings show that the water level is as much as 1.3 meters or 51 inches higher in the recent past. I guess the trick is to know when the water level is highest. As I row back past the Neaves Road Bridge, I see an inflatable raft coming downstream. There must be a place to launch from up river. A row of trees on the South bank. This row of trees on the South bank is downstream of the Neaves Road Bridge. A kayaker heads downstream too. A kayak does have an advantage over Gwragedd Annwn…less draft. The little excavator putting a new bucket on the big excavator. 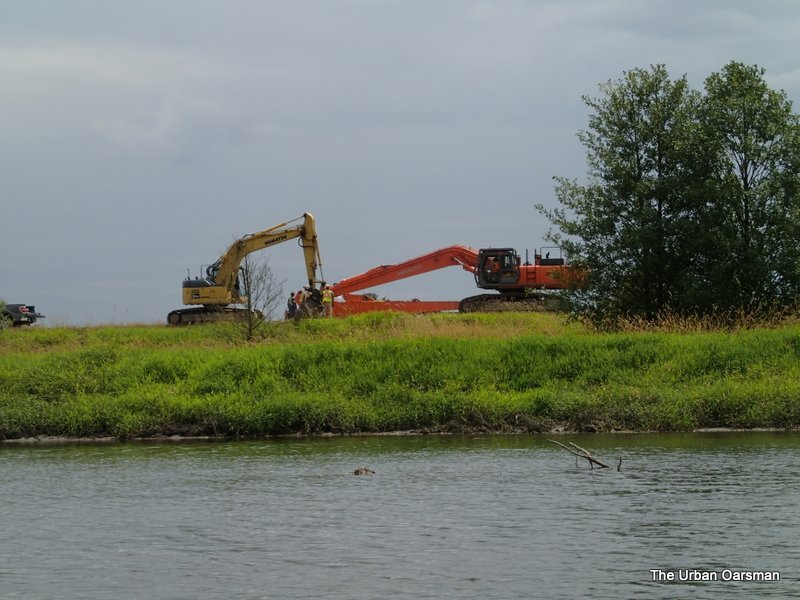 A crew working on the south dike near the pump station. Many routes are blocked by these pump stations. I need a lighter boat to portage around them. There are thousand of these flowers along the river banks. Birds on Dead Tree Island. Returning. 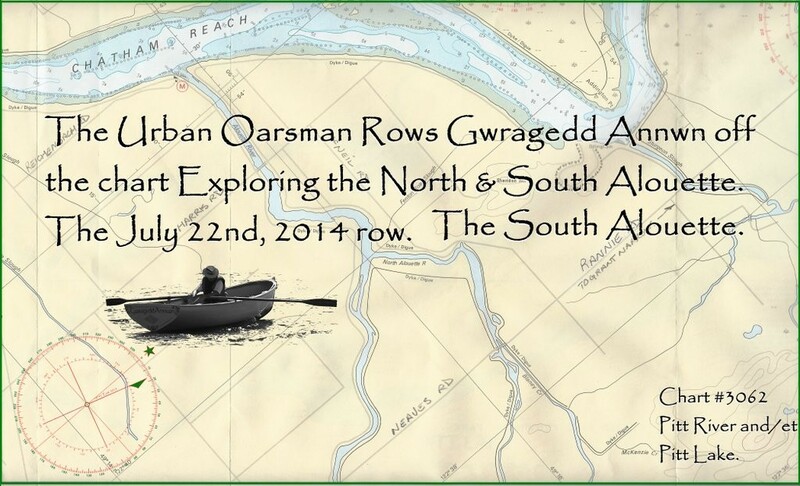 I am rowing down the southern channel . 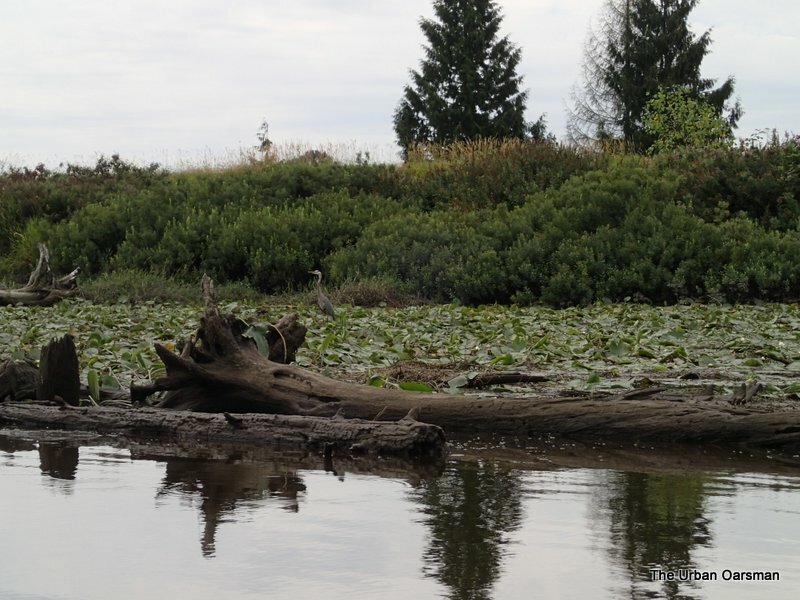 Remains of pilings where the Alouette Meets the North Alouette. There must have been some sort of dock here long ago. 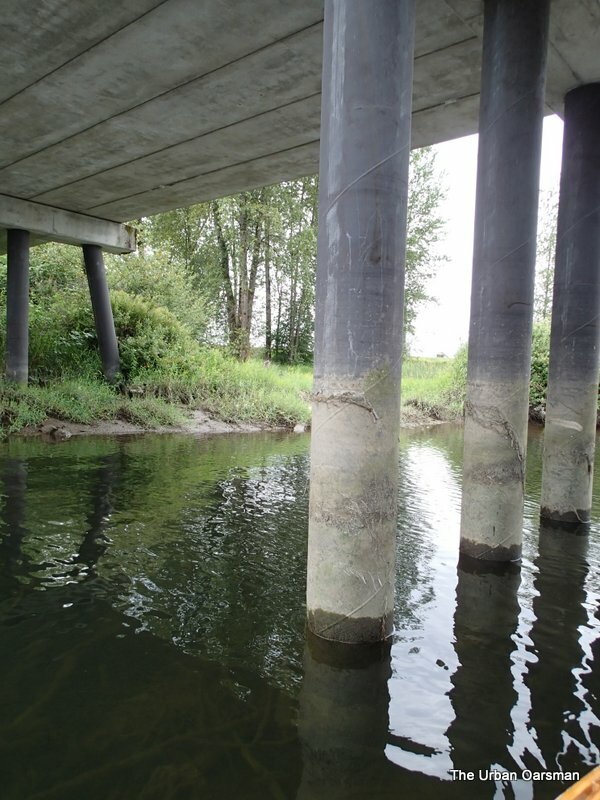 I do not know what these pilings were for. 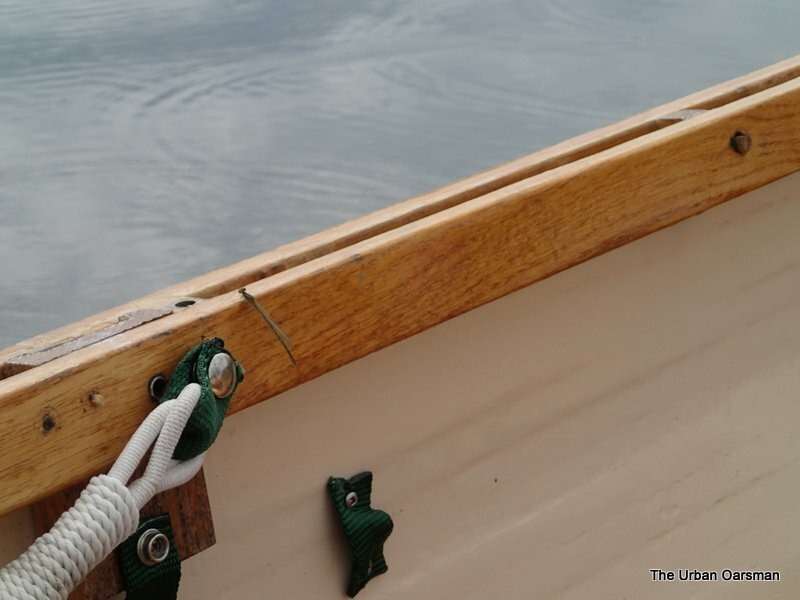 Shipping local produce or lumber out? 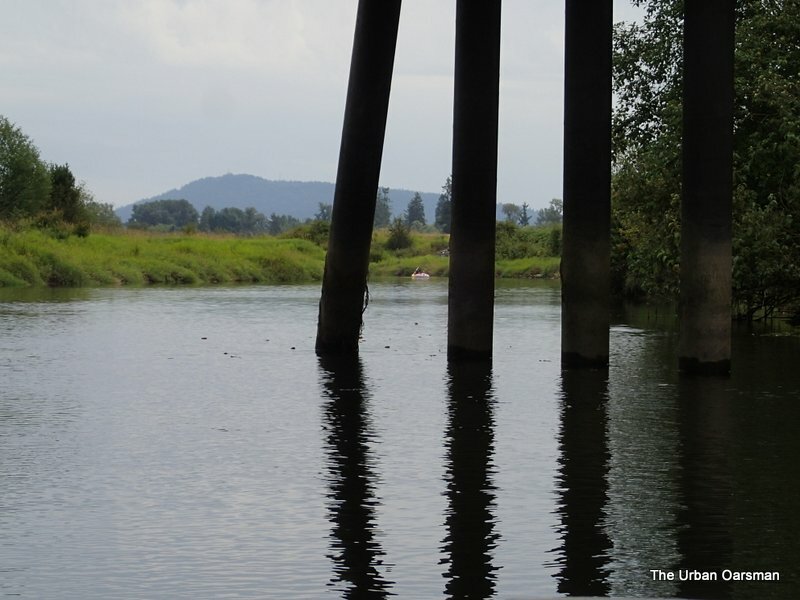 In this section of the river, you have to be very careful as there are many pilings just below the surface of the water. I collided with a few of them. 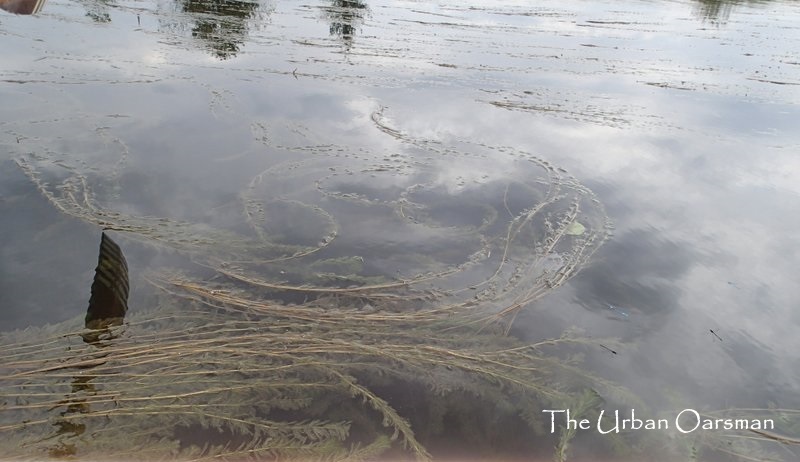 The weeds in the river show a slight downriver current. Another Blue Heron on the river bank. A pair of paddleboarders head upstream. 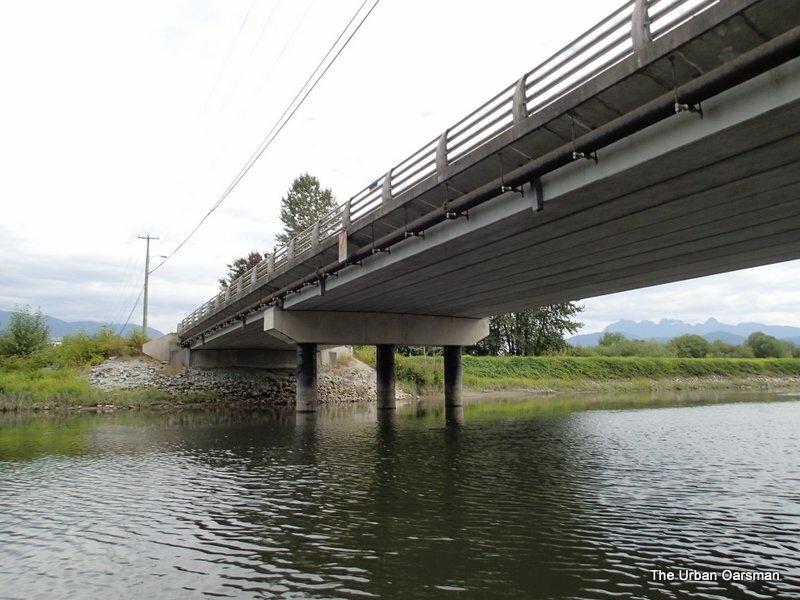 The Harris Road Bridge. 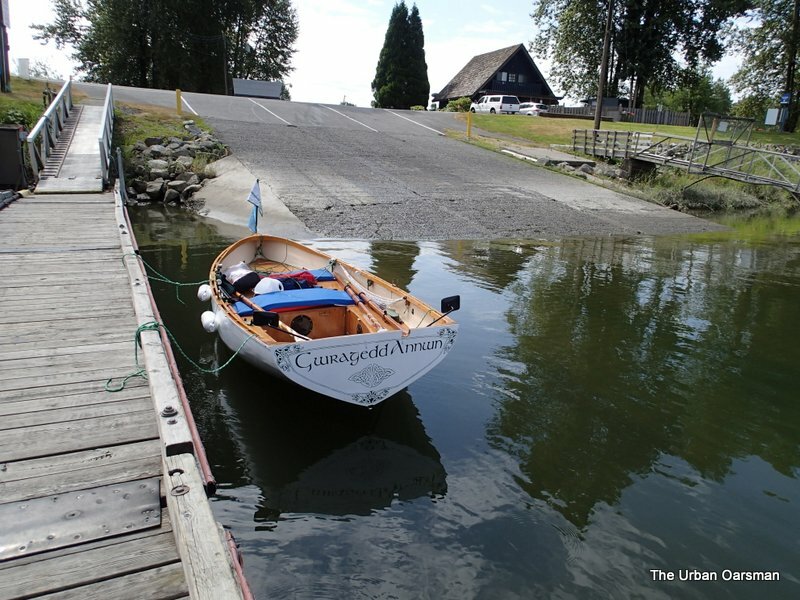 There is a “Hand-carried” boat access here. It is between the left and centre pillars, just to the right of the left pillar in this picture. 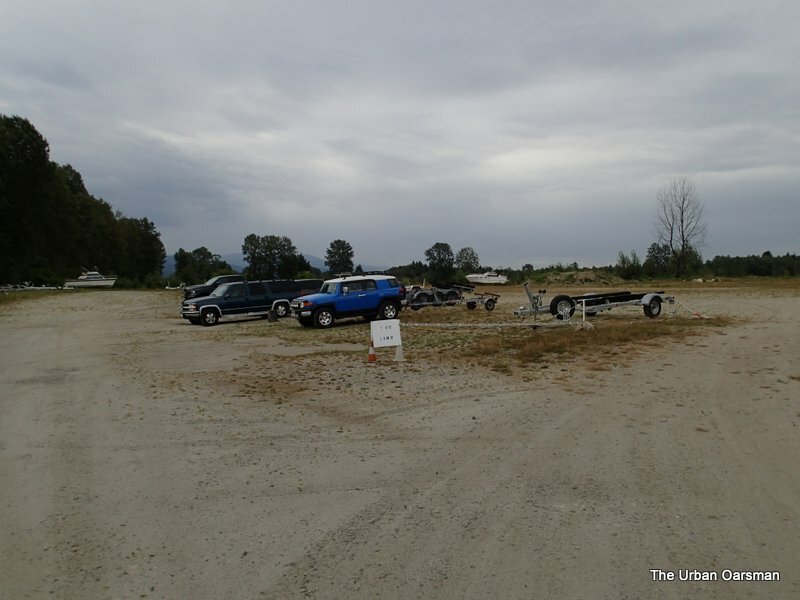 It leads down from a parking lot on the South East side of Harris Road and The Alouette. 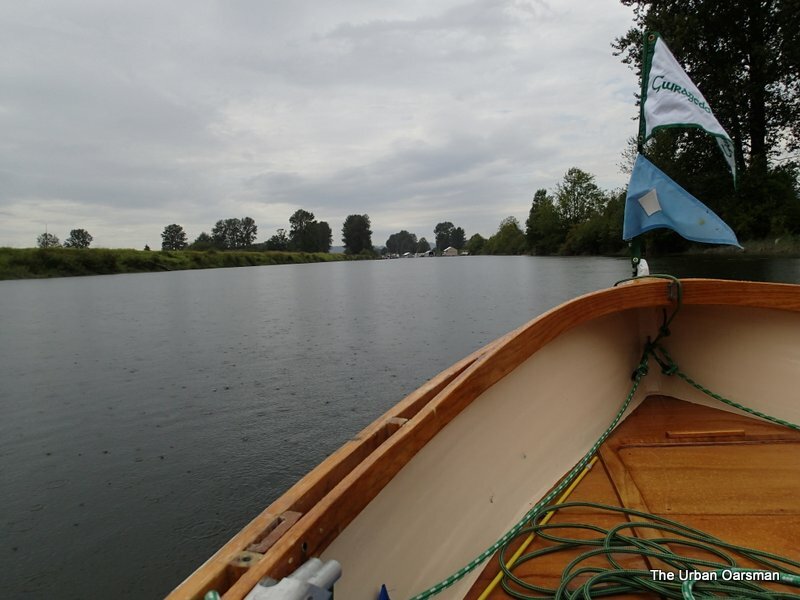 I guess that into every row a little rain must fall…. 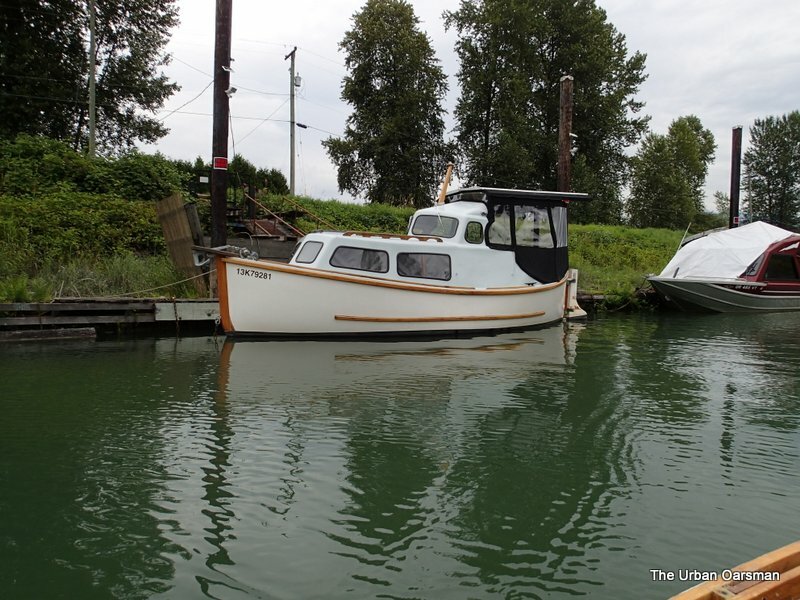 A bow view of the white abandoned boat…I have seen a picture of this boat still afloat in June of 2010. 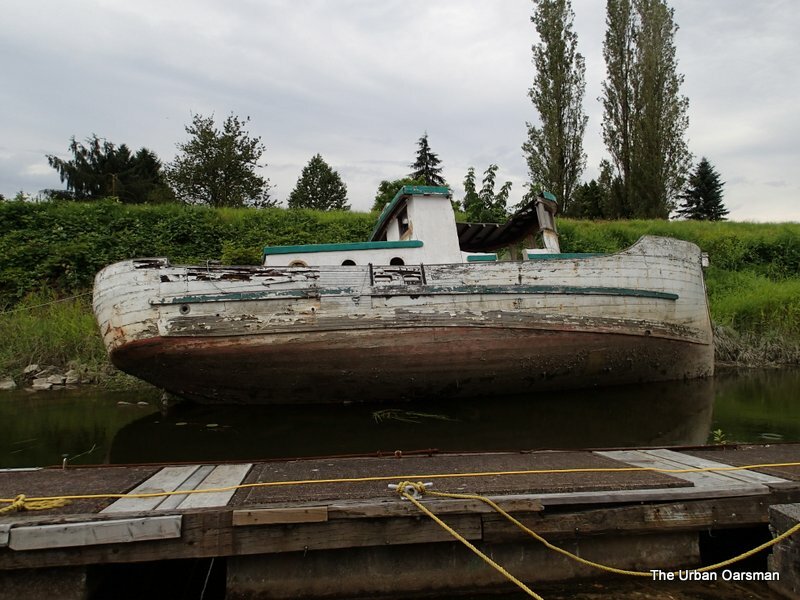 Side view of the abandoned boat. 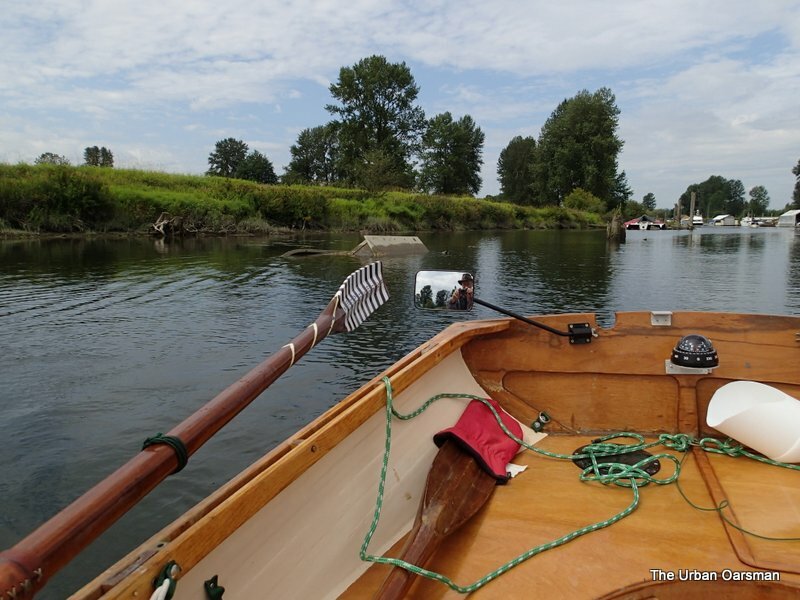 The water level has dropped since I row past her heading upstream. 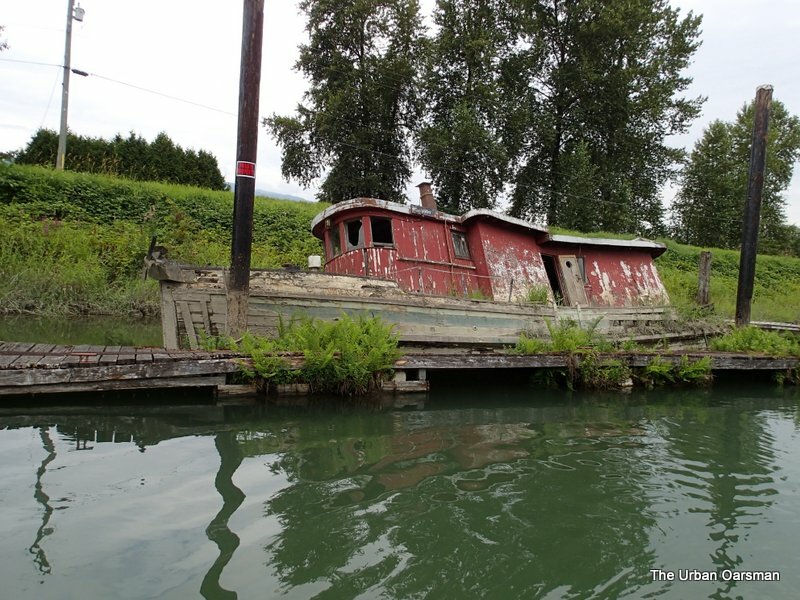 I row back past the red abandoned boat. It looks like her back is broken. Her life ring has been taken away to get her name painted on it. Note the power line to the dock. 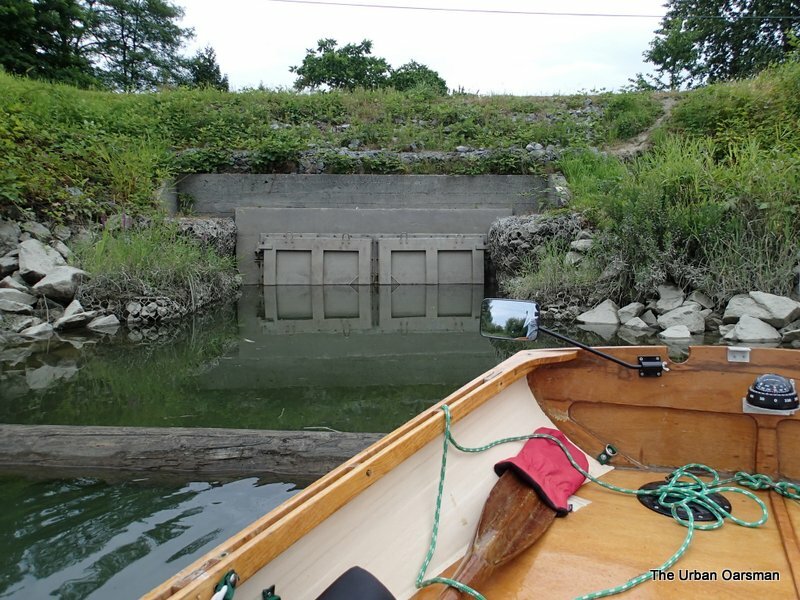 I decide that every time I row past these flood control gates I will take a picture so I can judge the water level. Gwragedd Annwn back at the dock. 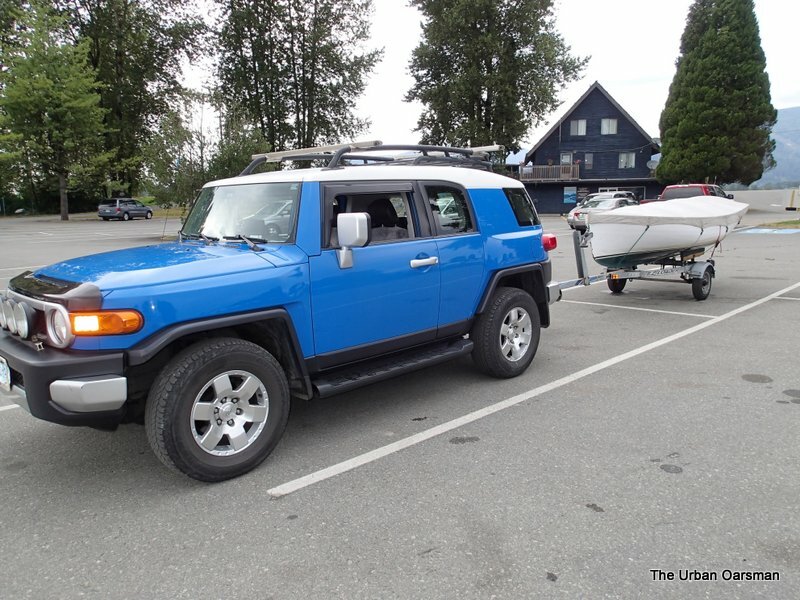 I walk back to the parking lot to get my FJ and trailer. My FJ in the parking lot. It is a short walk to the parking lot. There are only a few boats out today. Gwragedd Annwn looking good at the dock. All loaded up and ready to go. 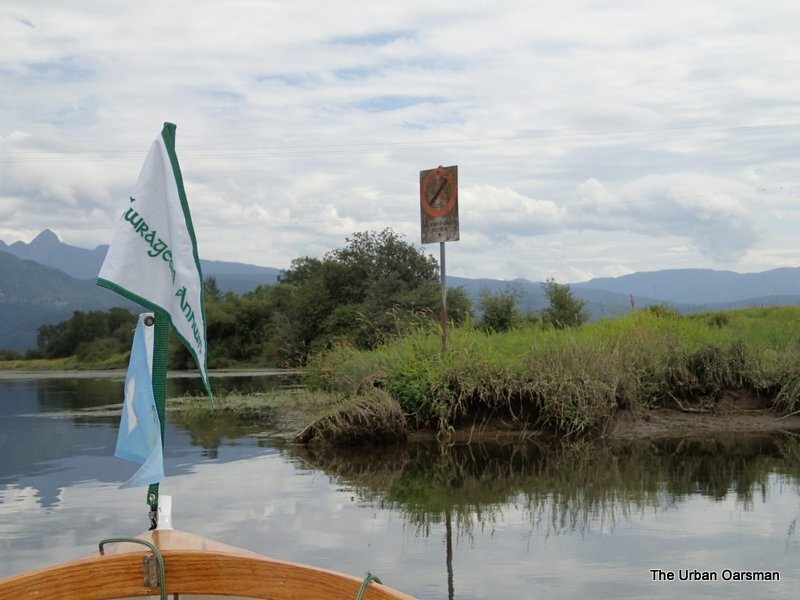 I will come back again with more time to row and explore past the Neaves Road Bridge. 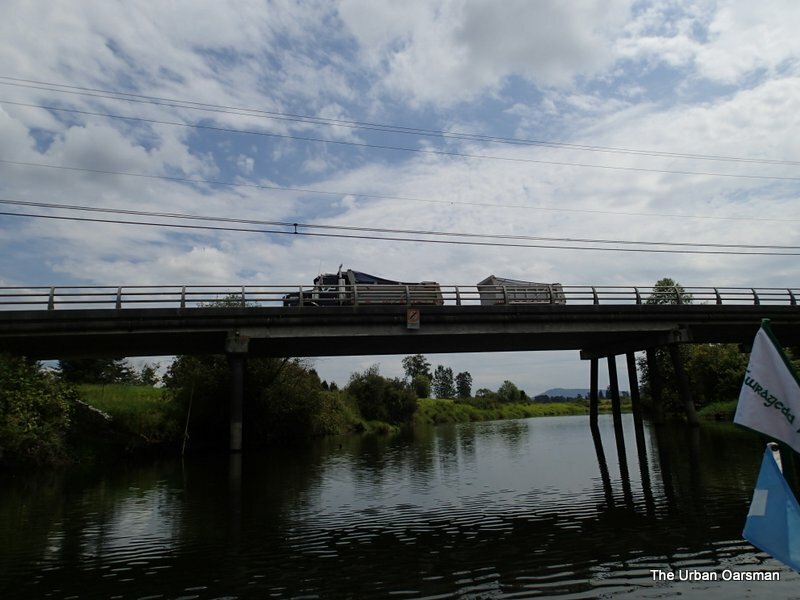 Trip length: 13.75 kilometers, 5 hours 15 minutes at the thwart. 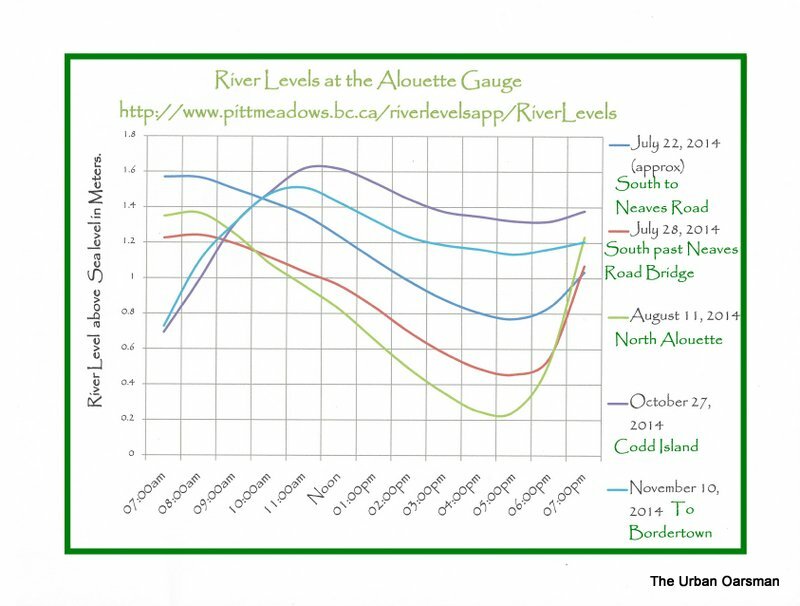 Alouette River Levels at the gauge. 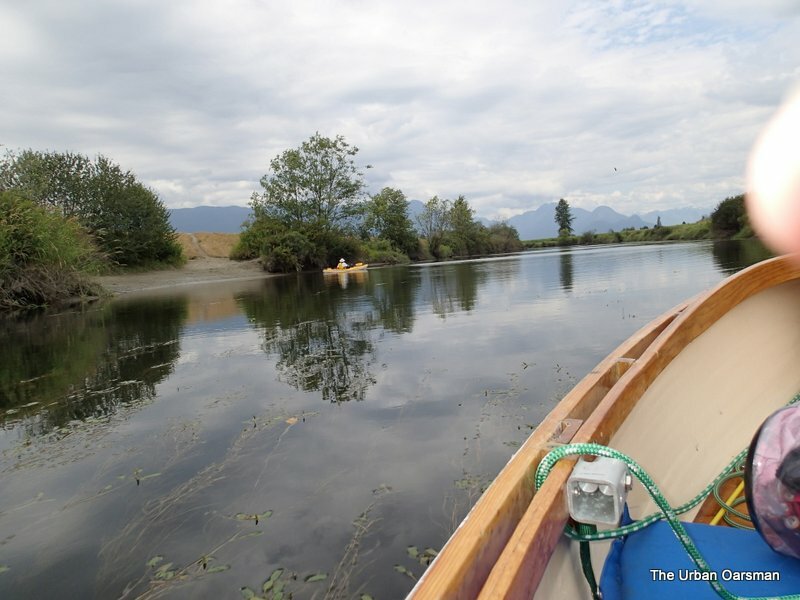 If you want to know the approximate river for your trip, go to http://www.pittmeadows.bc.ca/riverlevelsapp/RiverLevels? The assumption is that the level will not vary too much from day to day. Check the level the day before your trip and then add an hour to the levels and you will be in the “ball-park” range for the water level. There are not truly accurate tables for the river level. This is only an estimate.